"Ecologist and environmental historian Kent Mountford, chronicles the history of this important body of water from the days of the Lenni-Lenape and the earliest European explorers." "It is a masterful guide, before its time in many ways." A history of the Barnegat Bay region, Closed Sea weaves a colorful tale of whalers and pirates, Revolutionary patriots and loyalists, fishermen and loggers, iron masters and life saving crews, sportsmen and holiday makers. Filled with historical anecdote and keen observations of sea and shore, it is a compelling portrait of one place and its history. You will follow the earliest explorers as they first set eyes upon the pristine bay, the Dutch and British settlers who came after them and the intrigues and battles of the "Colonial Rebellion". You will meet the whalers who migrated from New England to New Jersey's coastal waters, and the many others who harvested the sea's various bounty. You will go with the men of the Life Saving Service into the icy, treacherous surf of a winter storm. Tales of shipwrecks and of pirate treasure buried on barrier beaches alternate with tales of the Pine Barrens, a place you will visit when it was a thriving center of 18th century industry. And, finally, you will join the early summer vacationers for rollicking times in the first guest houses of Long Beach Island. With a naturalist's eye and a sailor's experience, environmental historian Kent Mountford describes the history of New Jersey's Barnegat Bay region and its people, from the Lenni Lenape to 20th century summer vacationers. He opens our eyes to the Shore's past, its shifting inlets, disappearing islands, dangerous tides and shoals. Moving inland, he documents the Pinelands environment and the industries it has supported over the centuries. Closed Sea tells the remarkable history of a fascinating place, a place of great beauty, danger and opportunity, a place that has cast its spell on generations of people. "Kent Mountford grabs you with his first sentence. Closed Sea is a carefully put together account of the bay, its history, ecology, industries and people." 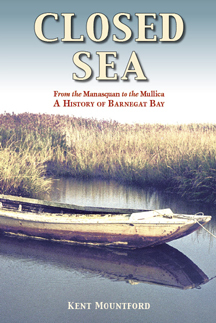 "Kent Mountford, estuarine ecologist and environmental historian, has had a fascination with Barnegat Bay since his college days; an affair of the heart, which blossomed into a book belonging in the library of anyone who has ever dipped a foot into this salt water. Closed Sea is a kind of historical, social, ecological and certainly in-depth Baedeker of the vast bay? and the shores it touches." An estuarine ecologist and environmental historian, Kent Mountford, PhD., spent thirty-six years studying North America’s Atlantic estuaries. While studying the then-polluted Potomac River for the District of Columbia government in 1980, he pioneered the concept of investigating a region’s early colonial literature in order to better understand its current problems. A popular speaker and writer, Dr. Mountford currently lives and works on the Chesapeake Bay, returning to Manasquan often where the family home still stands, near Barnegat Bay.